I just left the 2010 ACM Conference on Electronic Commerce, where six (!) out of 45 papers were about prediction markets. Yahoo! Lab’s own Predictalot market is now live and waiting for you to place almost any prediction your heart desires about the World Cup in South Africa. 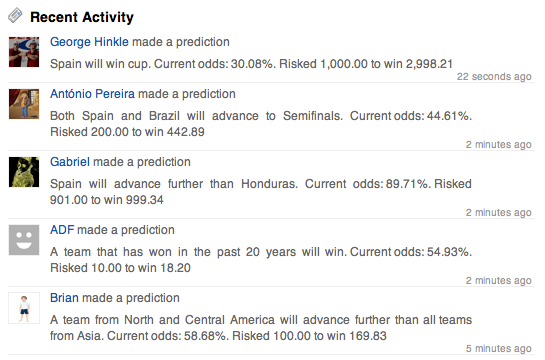 If you think these odds are wrong, place your virtual wager and earn some intangible bragging rights. You can sell your prediction any time for points, even in the middle of a match, just like the stock market. There are millions of predictions available, yet I really believe ours is the simplest prediction market interface to date. (Do you disagree, Leslie?) We have an excellent conversion rate, or percent of people who visit the site who go on to place at least one prediction — for March Madness, that rate was about 1 in 5. One of our main goals was to hide the underlying complexity and make the app fast, easy, and fun to use. I personally am thrilled with the result, but please go judge for yourself and tell us what you think. In the first version of Predictalot, people went well beyond picking the obvious like who will win. For example, they created almost 4,000 “three-dimensional” predictions that compared one team against two others, like “Butler will advance further than Kentucky and Purdue”. Also new this time, you can join a group and challenge your friends. You can track how you stack up in each of your groups and across the globe. We now provide live match updates right within the app for your convenience. Bringing Predictalot to life has been a truly interdisciplinary effort. On our team we have computer scientists and economists to work out the market math, and engineers to turn those equations into something real that is fast and easy to use. Predictalot is built on the Yahoo! Application Platform, an invaluable service (open to any developer) that makes it easy to make engaging and social apps for a huge audience with built-in distribution. And we owe a great deal to promotion from well-established Yahoo! properties like Fantasy Sports and Games. We’re excited about this second iteration of Predictalot and hope you join us as the matches continue in South Africa. We invite everyone to join, though please do keep in mind that the game is in beta, or experimental, mode. (If you prefer a more polished experience, check out the official Yahoo! Fantasy Sports World Soccer game.) We hope it’s both fun to play and helps us learn something scientifically interesting. Pingback: Biweekly Links – 06-18-2010 « God, Your Book Is Great !! Try this cautionary book before you unconditionally trust fortune tellers!